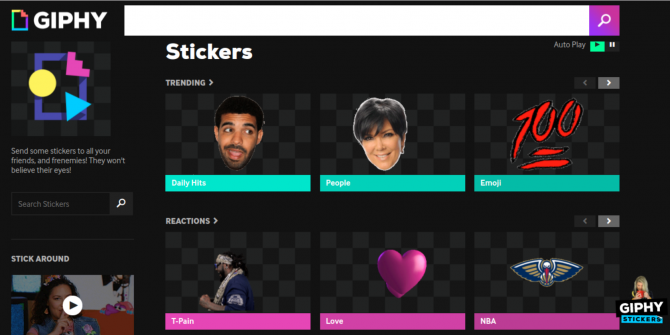 Giphy wants you to plaster your favorite websites with stickers. Why? Because why not? Most websites are rather dull, dry places devoid of much razzmatazz. But it doesn’t have to be that way. Giphy is on hand to help, with Giphy Sticker Embed letting visitors post stickers all over the shop. Given that Giphy specializes in GIFs GIFs, The Language Of The Web: Their History, Culture, and Future GIFs, The Language Of The Web: Their History, Culture, and Future Everything you ever wanted to know about the history of GIFs, how they've evolved, and their cultural impact and significance. Read More , the company obviously thinks the future is one filled with moving images. After all, static images and paragraphs of text are just so boring by comparison. However, standard GIFs may not be the answer. Because GIF stickers are Giphy’s latest innovation. Giphy Stickers are already a thing on iOS on Android, letting you post the perfect sticker into across messaging apps and social networks. Giphy Stickers was born from the ashes of Imoji, an existing app Giphy acquired to extend its reach. And now, Giphy is expanding its reach yet again. Giphy has signed up Thought Catalog and Quote Catalog as guinea pigs, so you can test Giphy Stickers out to your heart’s content. You can drag and drop stickers as you see fit, and then screenshot your creation for posterity. And when you navigate away, everything returns to normal. This all seems rather silly. Defacing your favorite website with a few well-placed stickers is fun for five minutes, but then they’re lost to the ether. So unless you get some perverse pleasure out of screenshotting your creations the whole thing is a waste of time. Still, people take selfies all day, every day I Acted Like A Prick With a Selfie Stick, Here's How People Reacted I Acted Like A Prick With a Selfie Stick, Here's How People Reacted Basically, no one reacted. No glares, shouted warnings, or lobbed projectiles. People just weren't that fussed. Read More , so this wouldn’t be the first example of people wasting their precious time. Do you like GIFs? Or are you sick of seeing the same GIFs posted over and over again? What is your favorite GIF of all time? What do you think of Giphy Stickers or Giphy Sticker Embed? What website would you like to deface with stickers, and why? The comments are open below!